Learn to build a bamboo frame in a weekend! Customise and create a better bike! about: unique experience learning to build a bike tube by tube.who attends: People wanting to build a bespoke bicycle or a unique experience.what are the prerequisites: The course suit complete novices or experienced builders. having taught 1000’s of people we can quickly asses skill levels to provide additional support only if needed.duration and format. : The workshop will have 4/6 participants with 2 teachers. The workshop runs from 9-5 Saturday and Sunday.whats involved: The course teaches all the skills to complete a bamboo frame. It will run through traditional frame-building methods. 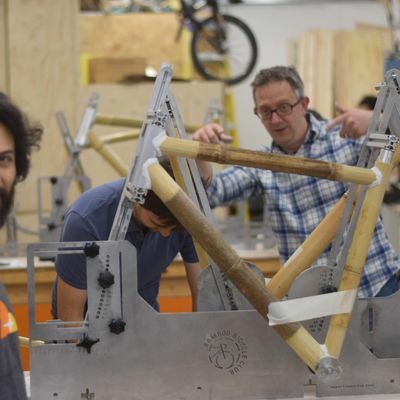 The course will also bring unique techniques for working with bamboo and joining using a composite associated with carbon fibre bicycles.